Bespoke Static and Mobile Stables hand crafted to suit your requirements and specifications, incorporating pressure treated materials throughout. 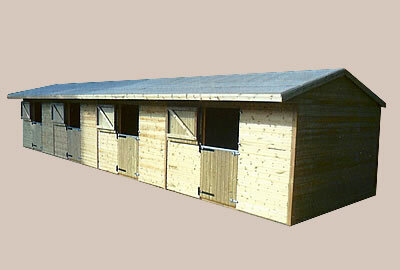 Horse Stables available from 12' x 12' (3.6m x 3.6m) upto 120' x 12' (36.0m x 3.6m) all using pressure treated timbers. Galvanised steel skids are available to turn your Static Stable into a Mobile Stable if required. 3” x 2” (75mm x 50mm) Frame work throughout, roof joists are 5" x 2" (125mm x 50mm). All timbers are pressure treated. 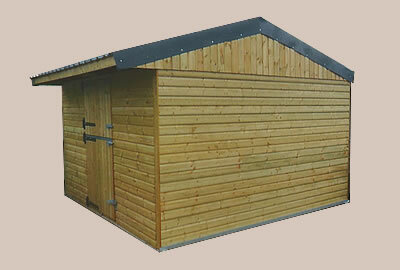 Galvanised steel skids are available if required, to make your Stable mobile, Tack Rooms can be added to Stables. Apertures for talk grills , windows and vents can be created at a specific size an no extra cost. (A) Once your building is constructed you will need to water proof it. We can recommend a product called 'Stable Coat' available from Protek Products (Shepton Mallet) protekwoodstain.co.uk Tel: 01749 344697 (apply three coats). Even pressure treated timber will need coating with a water proofer to prevent dampness. We also recommend sealing up all joints with a waterproof mastic sealant. Timber being a natural product is subject to movement i.e, shrinkage, warping, splitting, knot holes etc may occur, therefore we cannot guarantee against this. All our buildings are supplied with roof felt. Please note: We strongly recommend using felt adhesive and felt tacks both together for securing down roofing felt (these we do not supply). (B) Self Assembly - All buildings are supplied for self assembly, side walls are already made up for you, (stable doors and fittings are supplied loose and will need fixing into position). Roof trusses, Roof joists/perlins are sent seperately along with roof sheets etc, these will need trimming and fixing into position. (C) Skids - We offer two types of steel skids, both are galvanised, 80 x 40mm section being the lighter version and 100 x 100mm being the more robust. The 80 x 40mm skids are best suited for flat ground. It is the customers responsibility to make sure buildings are adequately braced including centre cross bracing before towing. Whilst towing move slowly and steadily, with out making sharp turns. We as a company accept no responsibility to structural damage to buildings or skids. Towing is strictly at the customers discretion. (D) Delivery - Field Shelter and Stable walls are heavy, delivery is strictly where ever practically possible, and always at our drivers discretion, we cannot go into fields or soft areas during winter months. Abled bodied assistance will be required for off loading walls from within three metres of our delivery vehicle, if this is not possible please notify us where we can provide an additional helper but at an extra cost. Deliveries are normally within 1-3 weeks, however if you can collect from us we can usually have your building ready within days! (E) Staking down Field Shelters/Stables - Field Shelters/Stables either static or mobile may need staking down and possibly other additions necessary during windy, gusty periods and especially in exposed locations. Roof perlins may also need extra fixings, and possibly metal brackets to help minimise issues. We as a company accept no responsilbilty for structural damage caused by strong winds.